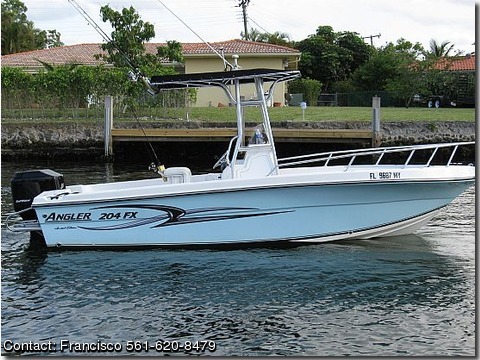 2005 Angler 204FX Limited Edition – Loadmaster trailer, bow rails, removable bow pad, Garmin 178 GPS/Fish Finder with Blue Chart maps of the Southeast US and Virgin Islands, Garmin Blue Chart Software and cables for home programming, Clairion AM/FM Radio and CD player, VHF Radio, Coast Guard Gear, Live Bait Well, Mercury 150 Saltwater Series Engine, 100 hour service performed less than a month ago, T-top and bench with rod holders and porta pottie in center console. Cruising Speed is approximately 28 mph top speed is 35 mph. The boat is in great condition. Owner wants to purchase a larger boat.